This is a controversial subject at times. 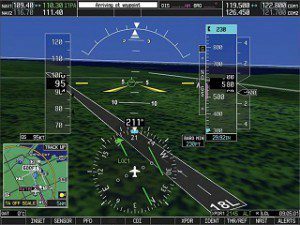 There is no doubt that the technology that has powered the airliners for years has now entered the general aviation scene with many G1000-equipped models available. Glass cockpits are also finally making their way into the training environment with brand new students flying aircraft fitted with technologically enhanced cockpits. This offers the new pilot a wide range of operational skill associated with learning on glass cockpits. Of course, none of this replaces learning how to read a map and looking out the window. The basic skills are still taught regardless of the panel. Ab initio pilots can expect a panel failure of some sort during the flight test, so the basics still need to be known. Remember, all glass-equipped training aircraft have traditional “round” backup instruments. The usual configuration is a traditional attitude, altitude, and airspeed three-pack. Several flights in the training process will be dedicated to using only these instruments. The difference in starting from scratch with glass cockpit training is knowing how to use the technology right from the beginning to improve safety. It is a lot easier to pull out a map in an emergency and revert back to the round dials versus learning how to use advanced technology in a pinch. Learning though osmosis, just being in the environment, is the easiest way to learn. Becoming comfortable with the advanced tools available in a glass cockpit makes the transition to IFR (instrument flight) instruction simpler. Glass cockpit instruments make it easy to interpret the vast amount of information a pilot wants available, making you a safer pilot. If you find yourself flying a basic six pack, which you certainly will, switching back to a round-gauge instrument panel is an easy step backwards. But regardless of the aircraft type in which you choose to train, you’ll benefit from a flight or two in the other type during your training.